Over 1200 of the most requested songs for nearly every occasion. 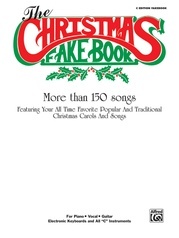 Features Jazz, Rock, Pop, Classical, Christmas, International, Sing-Along and All-Time Standards. The binding is guaranteed to lay flat. Includes classified index of all song titles. Ain't Misbehavin' * Conga * Ebb Tide * Old Time Rock 'N Roll * Proud Mary and more. Does Anybody Really Know What..
March from "The Nutcracker Suite"